The Beatles, Ed Sullivan, and Brian Epstein- Signatures from their Historic First American Appearance on the Ed Sullivan Show, February 9, 1964. A 12" x 10" inside cover of a foldover photo album containing an 8" x 10" early glossy of the Fab Four. It was signed by the Beatles at inarguably the most important single performance of their careers. All the signatures are in black ink and three bear personal sentiments to [almost certainly] Fred Kaps, a fellow performer on the show: "To Fred best wishes and see you on another tour! George Harrison", "All the best, Fred - keep smiling and touring! Paul McCartney", "lots of luggage Fred from John Lennon", and "Best Wishes Ringo Starr". If only just the Beatles had signed this on that magical night, it would be one of only a few such items that exist. The addition of the signature of the host of this legendary Sunday night variety show, "Hi Fred Ed Sullivan", makes it completely unique- the only known item signed as such. Their manager was with them that night and he also signed it: "Cheers Fred Brian Epstein". The desirability of an already unique item has now zoomed into the stratosphere. This is a set of signatures that transcends autograph collecting and even Beatle collecting. This is absolutely a piece of Pop Culture History. We haven't even mentioned that, at a later date, the road manager and press officer also signed this same photo album: "See you in England Fred Neil Aspinall" and "Derek Taylor -You were the most welcome member at any press conference or auditorium". The Beatles made history, pure and simple. The other signatories on this piece are the ones that were right there at their sides as it occurred, helping to make it happen. Without a doubt, the most important piece of Beatle memorabilia ever to be offered. This was their first live appearance in America and 73 million Americans tuned in to hear the young lads from Liverpool with the long hair. (Note: the population in the United States was approximately 190 million in 1964.) Your cataloguer is old enough to remember it well. America was glued to their TV sets as we heard the solemn-faced Ed Sullivan mention that the Beatles had received a congratulatory telegram from Elvis and the Colonel. In his introduction, he said: "Now yesterday and today our theater's been jammed with newspapermen and hundreds of photographers from all over the nation, and these veterans agreed with me that the city never has the excitement stirred by these youngsters from Liverpool, who call themselves The Beatles. Now tonight, you're going to twice be entertained by them. Right now, and again in the second half of our show. Ladies and gentlemen, the Beatles. Let's bring them on." The girls in the audience started screaming the second he finished. The cameras then focused on the Beatles as McCartney counted-in to an energetic performance of "All My Loving." That song was followed by Paul crooning a ballad from The Music Man titled "Til There Was You". (That probably won a lot of the young girls' moms over.) They closed out this historic first American performance with the infectious "yeah yeah yeahs" of their hit "She Loves You." Every time they sang "wooo" or shook their heads, the screams got even louder. They ended their first set with formal bows. About thirty minutes later, Ed Sullivan announced, "Ladies and Gentlemen, once again..." This time John, Paul, George, and Ringo performed both sides of their mega-hit Capitol single, "I Want to Hold Your Hand" and "I Saw Her Standing There." They then put down their instruments and walked over to shake hands with Sullivan. Performance over. History made. Payback complete for the "colonies" split from England nearly 200 years before. America was once again "owned" by the British. And this was just round one of the invasion; the Beatles opened the door for numerous British acts to make it in America. Of course, some act had the unenviable task to follow the Beatles' first American performance. That distinction fell to Fred Kaps, a world-class European magician who specialized in close-up sleight of hand tricks. We feel that this signed photo album folder was likely inscribed to him that historic night. In Kaps' long career in Europe, his and the Beatles' paths could have easily crossed at variety venues or television shows. The inscriptions would seem to indicate that they were familiar with this person named Fred as one who also toured. As an aside, there was another act on that night's show- five members of the Broadway cast of Oliver! appeared and performed two songs from the hit musical. The actor who played the part of the Artful Dodger was a young British actor and singer named Davy Jones. Of course, he would soon make millions of girls scream for him as a member of the Monkees. He later said of that night: "I watched the Beatles from the side of the stage, I saw the girls going crazy, and I said to myself, this is it, I want a piece of that." Heritage is proud to celebrate the 50th anniversary of the Beatles in America by offering this amazing piece. We feel that the bidding will be fierce. We know that many many Beatle fans will want to call this their own. Don't let this opportunity pass you by; you may never have another chance to own such a unique item as this. This lot will include original signed letters from two of the most respected experts in the field of Beatles autographs and memorabilia: Frank Caiazzo and Perry Cox. The full texts of their enthusiastic endorsements of this lot are available on our website. We will mention just a couple of their comments. "It should be noted that the fact The Beatles signed this item on this historical date makes this arguably one of the most significant signed Beatles items in existence. The inclusion of Ed Sullivan's signature puts this item in a league by itself, because it is the only known such set to surface to date from this historical event." (Frank Caiazzo, 2011). "I'd say that certainly makes this singular item one of the most important and historic autographed items in existence. Not only is it a fantastic Beatles signed item marking what is their most important event, it is also important historically as that night is often documented as 'very significant' in changing our culture forever and aided greatly in helping our nation heal from the tragic events of late November 1963." [Perry Cox, 2013]. "The purpose of this letter is to serve as an appraisal for an item which has been signed by all four members of the British Rock and Roll quartet known as The Beatles. This item is the inside top half of a 10" X 12" individual gatefold photo album, designed to hold one 8" X10" photograph. All have signed this item beautifully in black ballpoint pen and added the following sentiments before their respective signatures: John Lennon wrote 'lots of luggage Fred' before his signature, Paul McCartney has written 'All the best, Fred-keep smiling and touring', George Harrison has inscribed 'To Fred best wishes and see you on another tour!\ and Ringo has added 'Best Wishes'. All of the signatures are near perfect, complete examples by each member. 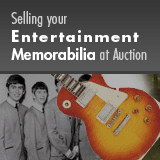 This item was signed on the night of February 9,1964, at the CBS Studio # 50 in New York City, which was the home of the Ed Sullivan Show, where The Beatles appeared on the evening of that date for their first ever performance in America. In addition, this item includes the signatures of Ed Sullivan and Brian Epstein, both of whom were present on that historical night. Ed has signed nicely in purple ballpoint pen, 'Hi Fred Ed Sullivan' and Brian has signed 'Cheers Fred Brian Epstein' in blue ballpoint. Brian Epstein, The Beatles' manager, was very instrumental in booking the group to appear on the Ed Sullivan Show. The 'Fred' that The Beatles, Sullivan, and the others refer to on this item is most likely the famed European magician Fred Kaps, who appeared on the show that evening. The signatures of Neil Aspinall and Derek Taylor also appear on this item. Each was added shortly after The Beatles signed it, but at a later date. Both also wrote short messages to Fred. Neil wrote 'See you in England Fred', and Derek added 'You were the most welcome member at any press conference or auditorium'. Neil Aspinall was the long time road manager for The Beatles, who is now the managing director of Apple Corps. Derek Taylor was Brian Epstein's personal assistant beginning in 1964 and eventually rose to the position of The Beatles' press officer. Brian Epstein, of course, was largely responsible for bringing The Beatles to the world's attention with extreme care and affection when managing the group. "It should be noted that the fact The Beatles signed this item on this historical date makes this arguably one of the most significant signed Beatles items in existence. The inclusion of Ed Sullivan's signature puts this item in a league by itself, because it is the only known such set to surface to date from this historical event. This was the very night that launched 'Beatlemania' in the U.S. and the rest of the world excluding the U.K., where 'Beatlemania' was in full swing already. As noted, this was The Beatles' first ever U.S. performance, and as thus, to many this night was the most historic and eventful occasion in The Beatles' history and to rock & roll history in general. This item is currently in the personal collection of Mr. Harlan P. Busch, as above. This item is reproduced below, reduced in size. "I place a value of $125,000 on this item. This is the current market value, as well as the current replacement value of this item as of this date. "I can scarcely think of a greater single event in Beatles history than their appearance on the Ed Sullivan Show February 9, 1964, in New York City. No other single moment did more to propel them to the attention of U.S.A. and indeed, the world than their performances that evening viewed by over 73,000,000 Americans! "To date, there are a handful of very nice items that were known to be autographed by the Beatles on that incredible day and evening. Among them are a couple of albums, a wine bottle, and even a section of the backstage wall from the Ed Sullivan Theatre in New York City! All of those items are now considered world class artifacts from a night the entire world will long remember into the next millennium and well beyond. "Considering the magnitude and importance of that evening, one might assume that many of those signed items would've also been signed by the legendary host himself, Mr. Ed Sullivan! The surprising fact is that to date, we've only verified ONE single item that was actually signed by The Beatles and Ed Sullivan together! That's right ONLY ONE!!! "Yes, in all the enormity of that evening, and to date, only ONE single item has ever been verified to exist that was signed by both The Beatles and Ed Sullivan together. That being an old style gatefold freestanding framed picture of the Beatles signed on the inside blank panel area by all four Beatles and Ed Sullivan! I'd say that certainly makes this singular item one of the most important and historic autographed items in existence. Not only is it a fantastic Beatles signed item marking what is their most important event, it is also important historically as that night is often documented as "very significant" in changing our culture forever and aided greatly in helping our nation heal from the tragic events of late November 1963. Now add to this the fact that the item was also signed by their beloved manager, Brian Epstein and its importance becomes even more prominent! "In all areas of collecting, be it pop culture or historical, there are those items that rise to the very top levels in terms of importance and significance. This one item signed by both the Beatles and Ed Sullivan together stands among the very best there is and ever will be to own and treasure. It truly is a one of a kind item and it couldn't have represented a greater event than the amazing night the Beatles appeared on the Ed Sullivan show. This item cannot be shipped using standard methods. Please contact us for more information. Consign to the 2019 September 22 2019 Fall Luxury Accessories Signature Auction - Beverly Hills Luxury Accessories - Beverly Hills. This is the most impressive book I have ever seen!